Welcome to More Front Wing’s weekend live blog from the GoPro Grand Prix of Sonoma at Sonoma Raceway! Steph Wallcraft will be reporting live from trackside all weekend long. The page always has the most recent update at the top, so please scroll to the bottom and read up to start from the beginning. Comments are most welcome — please leave them either in the comments section below or email them to steph@morefrontwing.com. To access time sheets, schedules, and other statistical information, please visit More Front Wing’s GoPro Grand Prix of Sonoma Event Summary. 4:23 PM (Pacific): As you can see from the posts below, I didn’t spend a lot of time in the paddock or on pit lane today. The one piece of news I can give you is more about a lack of news: regarding his contract negotiations, James Hinchcliffe isn’t talking. He’s keeping his cards very close to his chest and plays a very good poker face. There are no signs to indicate there will be any movement on that front this weekend. With that, I’m going to wrap things up for the day. I’ll be back here at Sonoma Raceway tomorrow for the morning warm-up session at 11:00 AM local time (2:00 PM ET) and the Firestone Fast 6 qualifying session at 2:30 PM local time (5:30 PM ET). The latter will be broadcast on NBC Sports Network at 9:00 PM ET, so avoid social media if you don’t want to encounter any spoilers! The view from directly in front of turn 9a in the turn 9 terrace at Sonoma Raceway. 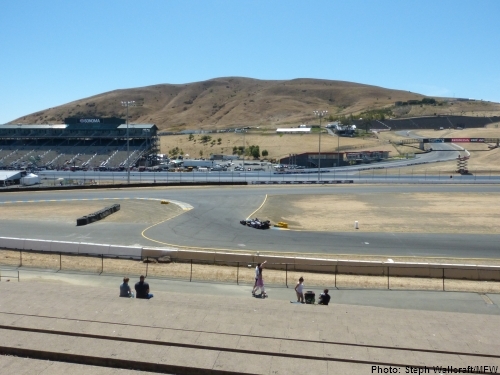 The view from the trackside RV parking area at Sonoma Raceway. 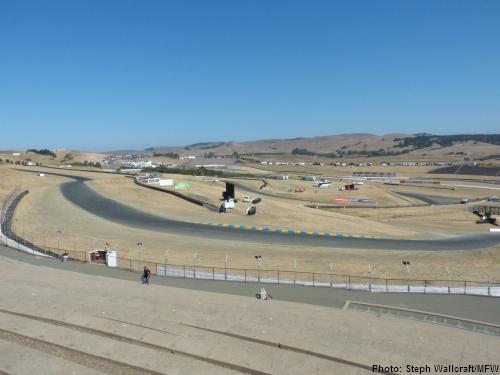 The view from the top of the turn 7 terrace at Sonoma Raceway. 4:02 PM (Pacific): During the second practice session, I walked out to the east side of the track to explore the terraces at turns 7 and 9. The turn 9 terrace was the one I encountered first, and it’s a general admission area along with turn 3. Were I here with a general admission ticket, I’d head straight for sections H and I in turn 9 as early as possible on Sunday morning to secure a seat in front of turn 9A. Those two sections offer an excellent view of that turn and much of the track, but the rest of that terrace is underwhelming. After that, I headed to the turn 7 terrace, another area with reserved seating along with turn 2. The hairpin is an excellent place to watch IndyCars from. (Evidently, Target agrees — their hospitality area is located here.) However, I’m not as sold on this being the best place in the track to buy a ticket as I expected to be. For one thing, it’s very far from everything. (There is a shuttle that fans can use to get around here, but that process still takes time.) For another, there’s very little nearby in the way of facilities or amenities. And personally, I find the dramatic uphill climb from turn 1 to turn 2 to be a more interesting place to watch IndyCars at from a technical perspective. For my money, my first choice is therefore the south to middle of the turn 2 terrace. There’s also an RV parking area right next to the track at turn 8. It’s not the best view going, but for those who enjoy the RV life at the racetrack it will certainly do the job. There’s another campground set back from the track, but it appears to be RV only (i.e., I didn’t see any tents set up there). I’d imagine it’s also more affordable, so camping down there and walking to the GA grandstands is certainly a viable option. As I was watching this afternoon, I looked across at the pit lane grandstand and discovered a factor that might lead someone to sit there: it gets shade in the upper rows pretty early in the day thanks to the overhang. For those who are very sun-sensitive or are bringing very small children, that might make all the difference. This track has plenty of accessibility options such as plenty of reserved wheelchair seating and the aforementioned shuttle, but for the vast majority of people this place will involve a lot of walking — some might even call it hiking — so a practical outfit and comfortable shoes are a must. (In other words, this ain’t Long Beach.) Also, if you decide to venture into the grassy areas, be warned: there’s a lot of sheep poop around. In terms of food options, the vast majority of the concessions sell just Track Food: pizza, corn dogs, burgers, and other similar greasy fried fare. There’s one concession stand under the main grandstand called The Sonoma Meatball Company that looks interesting with some unique twists on the classic meatball. Otherwise, the food options are fairly run-of-the-mill. And if you have food restrictions of any kind, it’s highly unlikely you’ll be able to find something that will work here, so bring your own. I’m about to add a few more photos and a couple of quick updates, and then it will be time to finish up for the day. Andretti Autosport’s hospitality area as it overlooks Sonoma Valley from between turns 2 and 3 at Sonoma Raceway. 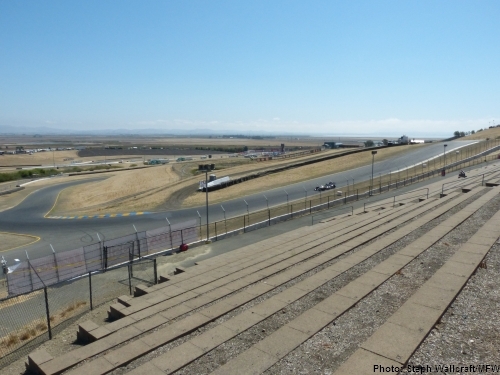 The view of turn 4 from the north side of the turn 3 terrace at Sonoma Raceway. 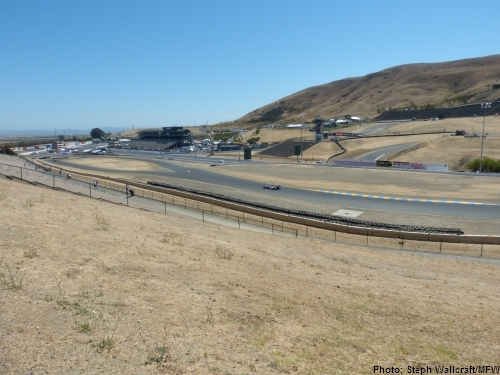 The view from the exit of turn 2 into turn 3 from the turn 2 terrace at Sonoma Raceway. 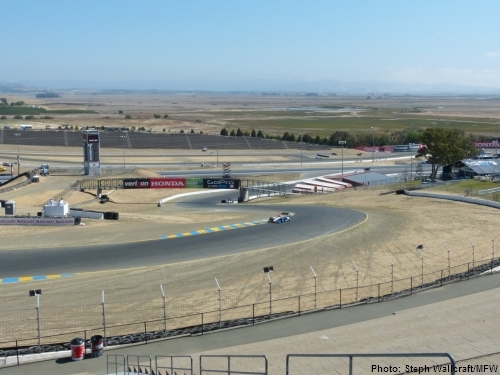 The view of turns 1 and 2 from the turn 2 terrace at Sonoma Raceway. 12:55 PM (Pacific): Just announced at a press conference: Schmidt Peterson Motorsports has renewed its relationship with Honda for the 2014 season. SPM is the first team to confirm its engine partner for next year. 12:52 PM (Pacific): I had a chance to take a walk around the west side of the facility, roughly from turn 11 to turn 4, during the morning practice. Seriously, people: this place is stunning. There is not a picture or a video that exists anywhere that will give a proper impression of how beautiful this place is and how dramatic the elevation changes are. It’s also true what keeps being said about how essential this event is for client and sponsor entertainment. 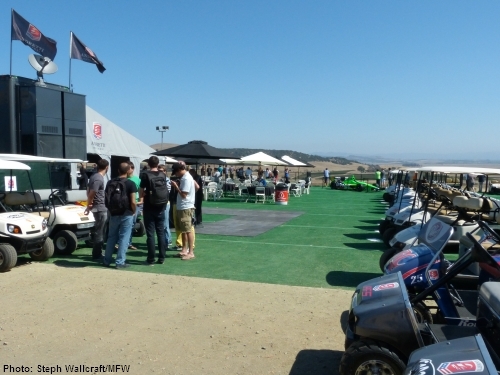 Most of the hospitality areas are set up on a hill between the terraces at turns 2 and 3 that overlook most of the track, the hills, and San Pablo Bay. When people say they don’t care whether the fan seating is empty all weekend long for this one, they’re not kidding. Entertain someone at the track with that vista during the day and drive them around for dinner and a few winery visits in Sonoma Valley in the evening, and you’ll hook that sponsor for life. Further to that, the place is pretty well deserted today. If you’re a serious IndyCar fan looking to get lots of autographs and unobstructed photos, Friday at Sonoma Raceway would be a very good day for that. Pit lane grandstand. Unless I was a great deal more interested in what’s going on in the pits than seeing any on-track action, this is the last place I would sit. It’s close to what appears to be the vast majority of the fan amenities, but the views of the rest of the track are extremely limited here compared to some of the other options. Turn 2 terrace. This is one of the ticketed terraces along with the one in turn 7. I could sit here forever and be happy. I wouldn’t even need there to be race cars present (though it certainly doesn’t hurt that there are!). For my money, I’d take sections 2B or 2C given the choice, though just about anywhere here would be awesome; you get a great view of much of the uphill approach to turn 2 and over to turn 3, plus much of the east side of the track as well (plus the mist-covered hills, the vineyards, the lakes, the bay, the clear blue sky, etc.). I’m not ready to call this the winner yet without seeing the terrace in turn 7, but it’s certainly an excellent option. Turn 3 terrace. This one appears to be general admission seating along with the terrace at turns 8 and 9. Without having yet visited the latter, my inclination is that I’d rather be over there than in turn 3, but I’ll find that out for sure later today. Infield family seating. Because of the IndyCar configuration for this track, there’s nothing to see here. Unless you have a serious aversion to people or have a child who just will.not.sit.still, don’t waste your time trekking out to this area. You’ll be disappointed. One thing I hadn’t realized about the seating here is that it’s all made of concrete bricks that are very deeply set and have loose dirt in the middle, so you wouldn’t want to sit on them for very long without something to support your back. Many people appear to have camping chairs, and I’d consider that pretty well essential. (If you’re flying in, bringing one of those small folding cushions with the back support tethered on would be clever.) There are also lizards wandering around. They’re cute. Another quick observation: Paul mentioned on the podcast recently that Apex Brazil appeared to have dialed back its IndyCar involvement. It turns out that they have an enormous hospitality area set up here, for what that’s worth. Off to take a wander through the paddock, then (ideally) to check out the east side of the track and the terraces at turns 7 and 9 later today. 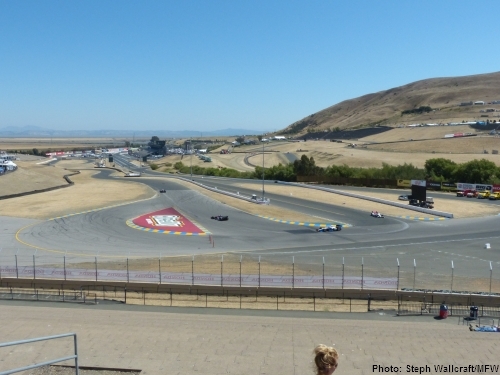 10:25 AM (Pacific): Good morning from Sonoma Raceway, where this weekend the IZOD IndyCar Series will race the GoPro Grand Prix of Sonoma! I’m thrilled to be trackside reporting live all weekend long. More Front Wing is here this weekend only due to the support of a sponsor, and at his request we are dedicating our coverage this weekend to the Indianapolis chapter of Greyhound Pets of America, a not-for-profit organization that helps retired racing greyhounds find loving homes. If you enjoy what you see here, please consider clicking on the banner at the top of this page to visit their website and make a donation. Your support would be greatly appreciated! This weekend is pretty quiet in terms of open-wheel on-track activity — the only Mazda Road to Indy series racing is the IZOD IndyCar Series. (If you’d like to take a look at the event schedule, you can find that information and much more at our GoPro Grand Prix of Sonoma Event Summary.) I’m hoping that the relatively relaxed schedule will give me a chance to take a look around today and explore some of the different vantage points around the track. The rest of this update is discusses travel, so no need to read on if that doesn’t interest you. And then I arrived at San Francisco. I am so lucky to have a very good friend who lives in downtown SF, and she’s very kindly letting me bunk with her for the weekend (and we became such good friends because she also happens to write for this site — hi, Bash!). What an amazing city San Francisco is! It covers all the basics one hopes for: safe, clean, driveable (well, by city standards), tons of character, and very tolerant and welcoming. There are beautiful examples of art deco architecture around every corner. It’s very environmentally conscious with its trolleys, car sharing programs, and electric and hybrid cars on every street. Even the Starbucks outlets are cooler here. To be honest, I probably love San Francisco so much because it feels a lot like my home city of Toronto. It only took me about four hours in SF to realize that the city had me at hello. I departed the city at around 8:00 this morning, crossed the Golden Gate Bridge, and headed up into the Sonoma Valley with no traffic issues whatsoever. I’m very happy with my decision to stay in SF so far (admittedly, excellent company and price point notwithstanding). I’m told that the trip back in this evening is when I may begin to have regrets, though. We’ll see. I’ve been extremely fortunate to see a lot of lovely scenery, but this area is already among my favorite places in the world. Hey, Steph! Thanks for the mention! Again, it was absolutely wonderful to see you again!